These are perfect portion controlled bites! I love the way they look... No wonder you had to fight them off with a spatula! I hope you're feeling better. Strep made its way through my classroom. I keep waiting for the inevitable signs of a sore throat! These look heavenly! they would make me feel better! Hope you get well soon. I better find me a girl scout! These looks amazing! These are so amazing. I have book club next week. I think I am going to take these instead of my muffins. I just have to remember to buy the mini liners! Thanks for sharing this. I, too, skipped on the cake this week. Those are so cute and such a great idea!! What an amazing idea. I love it! I'm pretty sure I could eat waaaay too many of these little cheesecakes. 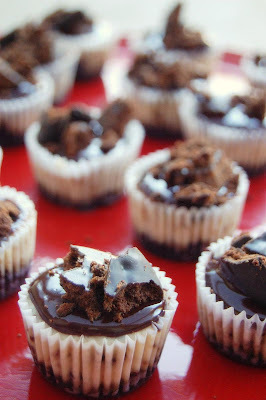 Chocolate, mint, cheesecake...a match made in heaven, no? It's so funny; I just posted about a chocolate mint cheesecake on my blog, and now, you totally have me wanting to try this one! Oh my word. I WAY overbought Thin Mints this year (actually, I do every year) -- they are my downfall. I am co-hosting a baby shower on Saturday and might just bring some of these along in addition to the other dessert we have planned. I hate to share my Thin Mints, but it's for a happy cause. These look incedible! GOODNESS! Yummy! Can't wait to make these sometime. Cuteness overload! Those look so cute and delicious. You always get me drooling every week! Those are amazing!! And Matt is right, you've gotta love the portion control! These look so good! I love girl scout cookies, especially the coconut caramel ones. Yummy! I'll have to give those a try. I'm sure my husband would love them. Hope you're feeling better. I woke up with the crud this morning... sore throat... whole nine yards. Can't wait for the package! Thanks Anne! I can totally use that nalgene bottle. OH NO!!! Did I miss the girl scouts? These look delicious! Thin mints are a major weakness of mine. Can't have them in the house because I will plow through them like there's no tomorrow! How fantastic is this?! I love it! And I hope you are feeling better! I hope you're feeling better! I had strep throat about a year and a half ago--I couldn't believe how sick I got! It's so much worse as an adult than as a kid. 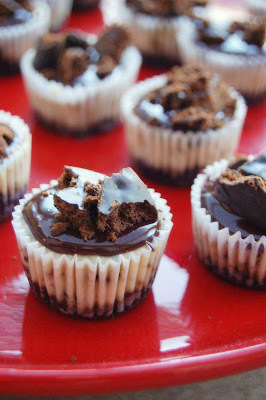 Your mini cheesecakes look awesome! i did not buy enough girl scout cookies for all these recipes I keep finding! They have to be scrumptious....they have thin mints in them. Yummo and bite sized too. That's dangerous. i will have to try these...as 2 boxes of thin mints showed up in my house yesterday!!! Wow.. these look adorable and sound fantastic. I just found your blog,how have I not found you before. I Love your blog. You are loaded with good stuff!! Yum! I always mean to bake with GS cookies, but they disappear too fast in our house :) I scrolled through your blog, and everything looks delicious! Darn those cute little girl scouts!! I swore I would not buy them this year (only because I love them too much and eat the whole box), but the little girls are just too sweet and always convice me to buy them. So I shelled out my $4.00 and bought the thin mints. Great way to use them. I am printing out your recipe. Those do look yummy. I love how lovely the top looks, very pretty! 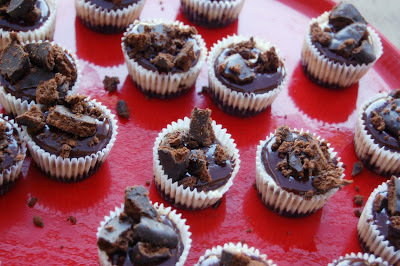 Wow, these look soo good - I have to try these I have some thin mints wanting to be used in the freezer right now.